Winners of Our New CFO (Chief Feline Officer) Name Contest! The most popular name by a landslide was Grace and some really fun variations: Gracie, Gracy, Grayse, Amazing Grace. Big thank you to Michelle and Jessica for selecting Madeline. That was the name she responded to the most (yes we tried every single name to see which she liked best) And a big thank you to Tonda for the Silver Belle part. 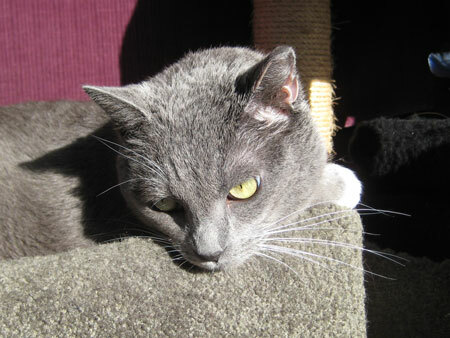 Madeline does not meow: she squeaks, chirps, and peeps – it’s like listening to a tiny silver bell jingle! A cat toy is winging its way to the three of you as a thank you gift from Madeline! Madeline Silver Belle is completely at ease with her new life. She’s never “had a job” before (other than being cute) and she’s enjoying her Cat Faeries duties which include: supervising, alerting us when it’s lunch time, testing toys, insisting we have an afternoon nap and pushing paper off desk tops. Here’s pictures of Madeline Silver Belle hard at work! Friends of Roman Cats is a US based organization which raises money for the street cats of Rome and other parts of Italy and for the cat sanctuaries. They help pay for spay/neuter, medical expenses and food. They also raise money to spay/neuter cats in San Francisco. Here’s some information about this very unique and special tour. We hope you can go! Ciao Bella! 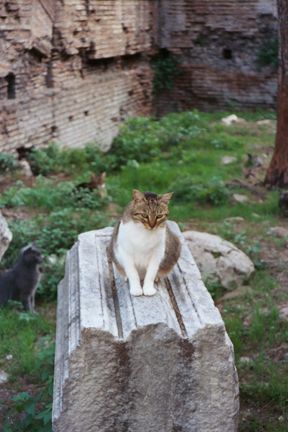 Friends of Roman Cats is excited to announce another Cats and Culture Italian tour this coming October! The tour offers cat lovers and lovers of Italy a chance to see how another country treats its homeless / feral cat population. Italy is a No-Kill country where cats have been appreciated for centuries for their companionship and for keeping down rodent populations. 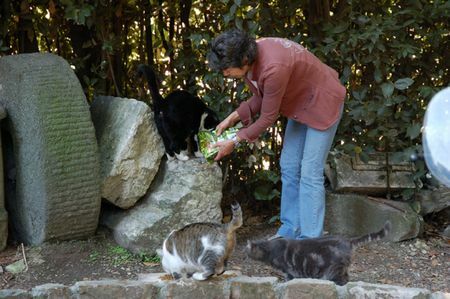 You will meet dedicated individuals who care for some of Italy’s stray cats and learn what is working and not working with Animal Welfare in another country. The tour will be a way for people to understand Italy and Italians through the way they interact with animals The tour will start in Venice where we will meet some of the cats whose ancestors came from the Middle East to combat plague-carrying black rats. 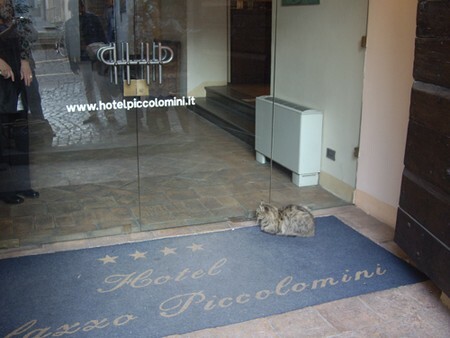 We will visit a cat colony that lives in Venice’s main public hospital and see more cats and their dedicated caretaker on Venice’s Lido Island. We will have plenty of time to visit some of Venice’s greatest artistic treasures and take in its beauty. The tour will proceed to Florence where we will see the cats that live in a magnificent Renaissance garden, and in a picturesque cemetery that looks down on the City. Participants will have ample time to explore this beautiful city. 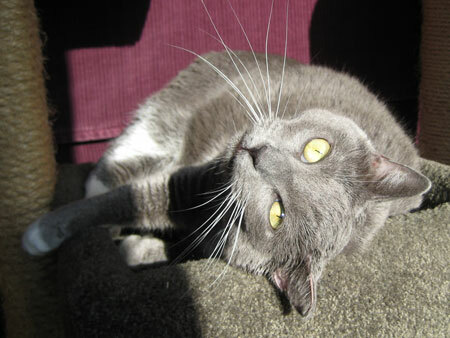 Then we will visit a cat sanctuary in the Tuscan hills on a property donated by a beneficent Countess. We will next visit the medieval town of Arezzo and meet with an Anglo-Italian veterinarian who has created a 21st century cat shelter outside the town. We will spend the next day and night in the beautiful hill town of Siena where we will have a guided tour of the town and visit with a group that works with the Sienese municipality to spay and neuter Siena’s stray cats. We will spend our last 3 days in Rome, visiting the Forum, Coliseum, The Vatican, the Trevi Fountain and other monuments in historic Rome, and as well as some of the cat colonies that live in the midst of Roman ruins. 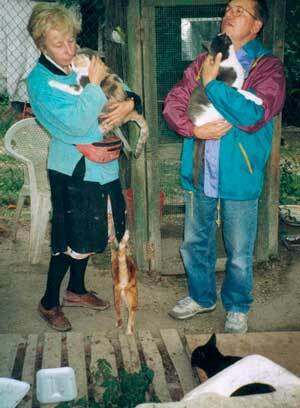 All the cats in the shelters and sanctuaries we visit have been spayed or neutered. A good number of them are former house cats that have either been abandoned or whose owners could no longer care for them. The tour will begin on October 7th 2010 and end on Oct.19. The price for 15 people will be $3,025 double occupancy. A single rate of $549 is available and there is a $500 deposit that will be refunded if we do not get enough people by May 1. It will include 3-star hotels or better with breakfasts, some dinners, a comfortable private bus, a one-time transfer from the Venice airport to the hotel, vaporetto tickets for 2 days in Venice, entrance fees to some museums and historical sites, local city guides and all the cats you can desire! $250 of the price is a tax-deductible donation and goes to help the shelters we will visit. 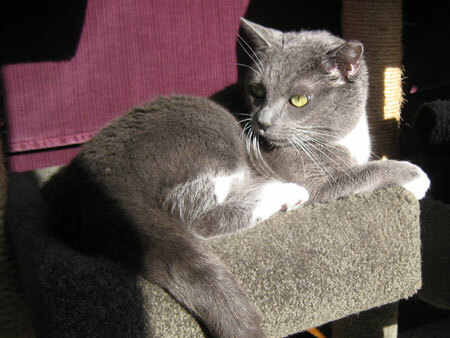 Susan Wheeler, President of Friends of Roman Cats will accompany the group. For most of the tour a tour manager will also accompany the group. The dollar is stronger right now than it has been in several years. This price is based on current prices so the sooner people sign up, the better. People who sign up before April 1 will get a $50 discount. A bill has been introduced in the California State Senate to register animal abusers, in a similar way to how Megan’s Law offenders must register now. We think this is great news and we thank California Senator Dean Florez for introducing this very important bill. Senator Florez is also involved with Expose Animal Abusers, an organization which wants this to be a national registry! We have written Senator Florez a thank you card and urge you to do the same. Even if you do not live in California, he will surely appreciate your good wishes and thanks. A link to a petition from Expose Animal Abusers – help get YOUR state involved.